Today you’re wondering when it will ever happen. Tomorrow, you’ll find out it already has. You’re about to be a mom; welcome to the wildest ride of your life! What an exciting time - one that you can rejoice in and savor. You’ll get advice from everyone you meet, whether you ask for it or not, but here’s what I would tell you. Cherish every moment. The time you have while you’re pregnant is precious - don’t wish it away or hurry it along, even when you’re tired and uncomfortable. The reward at the end is worth it. The same goes once he’s finally born. He will have tough times, but he’s only that age once in his life. Find good things to remember about the difficult times. You are not fat. Pregnancy is neither a reason to overindulge nor is it something to be embarrassed about. You wouldn’t hide a newborn nestled in your arms. Don’t try to wish away that beautiful baby bump. Or the hips, thighs or anything else that’s gotten bigger. You’re pregnant and you radiate beauty. Take pictures. Be able to show that little one what his mama looked like when he was growing inside her. Who cares if someone else barely shows when their in their 8th month? They aren’t you and that isn’t your baby. Assert yourself. Don’t let the doctor(s) dictate what’s best for you. Do your own research and make your own decisions in keeping with what you think is best for you and your son. Don’t be pressured by anyone outside of yourself and Matt to do something you’re not comfortable doing. It doesn’t matter what anyone else thinks of your decisions. You’re the only one who has to live with them. Don’t doubt yourself. You have good instincts and you will know your son better than anyone else. Other people can offer suggestions, but never let their comments create insecurities about your ability to be a good mother. You’ll make mistakes just like every other mother on the planet. That doesn’t make you a bad mother. Let go of what “they” say. Again, “they” don’t know you or your son. Not everyone fits into the nice little boxes “they” like to build. Learn to play. Lose the inhibitions and get down on the floor with that little boy. Show him what a strong, fun mama he has. Make informed, carefully considered decisions - even if they aren’t popular. Be confident in the choices you make and if you have to keep your decisions to yourself, that’s all right too. Sometimes it’s not worth debating points of disagreement. Breathe. There will be moments when you don’t feel like cherishing him. There will be moments when you can’t seem to reach the love you feel. Take a deep breath. Release it slowly. Repeat. Apologize if necessary, even if he doesn’t understand. Close your eyes and remember what you felt the first time you held him. It’s still there. Even when it’s hard to find. He’s the very definition of a type of love you never knew existed before. He’s going to change your world like no other change in your life to date. And, as hard as it will be, it’s worth every minute of lost sleep and stress. Enjoy him. Smile with him. Laugh at his antics. Guide him with wisdom. Be consistent. Love him unconditionally. He’s not a burden. He’s a blessing. Have you seen this video? It’s been floating around the internet the last couple of days and I finally got to watch it. It’s short and beautiful. And after watching it, I was inspired to write a letter to my pre-baby self to share what I’ve learned. Written in participation of Bigger Picture Moments.“A moment where you recognized the role your faith plays in your every day life. A moment where you take note of motherhood and the importance of what you are doing. A moment that made you stop and breathe in the bigness of it all. 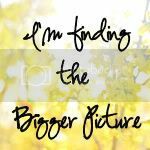 The hugeness that is life and the small moments adding up to one Bigger Picture.” Check out this week’s posts at This Heavenly Life.